Perry Fowler is your average proud Canadian. However, after living in the U.S. for more than 15 years, he's found himself rooting more and more for the Team USA at hockey events. 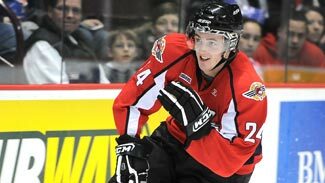 Hockey Canada fans can blame Perry's son -- top 2010 Entry Draft prospect Cam Fowler – for that. Well, it's also Ford Canada's fault. They're the ones who sent Perry Fowler over the border in the first place. "I was transferred," Perry Fowler told NHL.com. "I worked for Ford Canada and they transferred me to the States. I commuted because we lived in Windsor (Ontario). I was able to commute for a couple years back and forth because it was so close. But eventually, from a business perspective, there was much more potential to continue to work in the States for Ford, so we decided as a family to move over." "This truly was the first Olympics that I remember having pulled for the U.S. Just because Cam is part of USA Hockey. We've now lived in the States for a long time, and also because there were players on that Olympic team that are not too many years ahead of Cam, like Patrick Kane, Jack Johnson, Erik Johnson, guys we continued to follow as Cam progressed as a hockey player." Eventually, the family – which included 2-year-old Cam -- settled in Northville, Mich., where Cam grew up playing hockey and baseball. At 16, Cam moved to Ann Arbor to play for the U.S. National Team Development Program, and that's where his Americanization took full form. He starred for two years with the program's Under-17 and Under-18 teams, culminating with a spot on the U.S. team for the 2009 IIHF World Under-18 Championship in Fargo, N.D. Here's where Cam Fowler had to make one of those life-altering decisions. He holds dual citizenship (mom Bridget was born in the United States), so he could have played for the U.S. or Canada. He had to pick, and the decision would be final. For Cam, it really wasn't much of a decision -- after two years playing with the U.S. program, he was sticking with the red, white and blue. "There was no way he was going to turn his back on the USA team he had played with for two years at the Under-18 event," Perry Fowler said. "That's sort of the culmination of the two years, that's why you go there. He had played there for two years, great friendships. It was a no-brainer he was going to continue to play for the U.S."
Fowler starred in that tournament, finishing with 8 points in seven games as the U.S. won the gold medal and Fowler was named the tournament's best defenseman. So how did proud Canadian Perry Fowler react to seeing his son wear the red, white and blue? He did what any parent would do – cheered loudly. "It's my kid," he said. "It doesn't matter." Perry said it's to the point where he finds himself naturally rooting for the U.S. at international events even if Cam isn't playing in them. "This truly was the first Olympics that I remember having pulled for the U.S.," he said. "Just because Cam is part of USA Hockey. We've now lived in the States for a long time, and also because there were players on that Olympic team that are not too many years ahead of Cam, like Patrick Kane, Jack Johnson, Erik Johnson, guys we continued to follow as Cam progressed as a hockey player." Choosing which nation to play for wasn't as tough as the family's next decision – where Cam would play after leaving the USNTDP. Cam made a verbal commitment to Notre Dame at age 14, but was having second thoughts during his time in Ann Arbor. "For a couple of years, there was nothing in his mind whatsoever that was going to change that decision," said Perry. "It wasn't something you think about -- National Team Development Program and U.S. college after that. But it was going into his Under-18 year that really he started to seriously think about another alternative. It was a bit of a distraction for him." When Cam came home for Christmas break, he sat with Perry and Bridget and they discussed all the possibilities. The Kitchener Rangers had picked Cam in the first round of the 2007 OHL draft, but when he didn't sign, he went back into the draft and was taken by the Windsor Spitfires in the first round in 2008. The choice came down to staying with the plan and going to college and getting a Notre Dame education or taking the more pro-like OHL route -- including a 68-game schedule and long bus rides. "It was definitely a hard decision," Cam told NHL.com. But Perry was confident his son would make a good choice. "I said Cam, I don't want you to think about making the safest decision," Perry said. "I want you to make the decision you're most passionate about, that you're most committed to, and whatever decision that ends up being, commit yourself to it because that's what you want to do." The choice was Windsor -- and with an OHL title, Memorial Cup championship and high standing in the eyes of scouts, it seems like the right choice. "I was committed to Notre Dame," Cam told NHL.com. "I committed there when I was 14 years old. I was really excited about going to Notre Dame. I'm not taking anything away from that program, (coach Jeff) Jackson has done a great job up there. That's one of the premier colleges to play at right now. It's nothing personal, just over the course of the years, when you commit so early, things change sometimes and unfortunately Notre Dame turned out not to be my No. 1 decision anymore." Cam is renowned for his decision making on the ice, so it's no surprise he made the right choice here. Just like his father did many years before.